Welcome back to the Fiction Reboot! Historical Fiction: It can be daunting, and yet history has so much to offer in terms of idea generation. Take D.B. 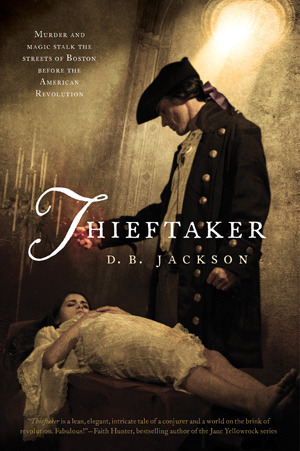 Jackson’s new novel: Thieftaker. The concept (not unlike a bounty hunter) comes from 18th century America. Jackson then takes this idea and uses it as the kernel of a fabulous book, interweaving magic and mystery along the way. Thank you, D. B. Jackson, for joining us today with your take on the writing life! D.B. Jackson is also David B. Coe, the award-winning author of a dozen fantasy novels. His first book as D.B. Jackson, Thieftaker, volume I of the Thieftaker Chronicles, will be released by Tor Books on July 3. D.B. lives on the Cumberland Plateau with his wife and two teenaged daughters. They’re all smarter and prettier than he is, but they keep him around because he makes a mean vegetarian fajita. When he’s not writing he likes to hike, play guitar, and stalk the perfect image with his camera. Boston, 1765: In D.B. Jackson’s Thieftaker, revolution is brewing as the British Crown imposes increasingly onerous taxes on the colonies, and intrigue swirls around firebrands like Samuel Adams and the Sons of Liberty. But for Ethan Kaille, a thieftaker who makes his living by conjuring spells that help him solve crimes, politics is for others…until he is asked to recover a necklace worn by the murdered daughter of a prominent family. 1. I have always identified with the Asimov quote: “I write for the same reason I breathe—because if I didn’t, I’d die.” Does this describe you? Could you say a bit about your early writing experiences? I absolutely identify with that sentiment. Writing is hard. It’s a hard way to make a living, it’s a hard art to master. Being a professional writer can be frustrating, discouraging, downright disheartening. And yet, I love it and can hardly imagine doing anything else with my life. Because the truth is, I HAVE to write. I have characters in my head, clamoring for my attention. I have stories burning a hole in my chest. I don’t know if I’d die if I couldn’t write, but I’m certain that I’d go nuts listening to those voices in my mind if I didn’t have a way to let them out. As for my early writing experiences, I wrote my first books when I was six. Seriously. I still have them. They’re not very good, and the illustrations are truly atrocious. But I was writing stories pretty much as soon as I could write words. For as long as I can remember, writing and storytelling have been a part of who I am, of what I do. Yes, it comes as naturally to me as does breathing. She is a wise and wonderful woman. I started writing, and by the end of those five months had not only a few rough short stories that served as character sketches for the main characters in my first novel, Children of Amarid, I also had five chapters of the book and a full outline of the rest of the story. I gave these to a friend who had agreed to act as my agent. Months later, in one 24 hour period, I received a job offer from the history department at a very good university and a call from an editor at Tor Books who wanted to buy my book. I had one weekend to decide which opportunity to pursue. I chose writing and really have never looked back. What does it mean to be a professional writer? Well, on one level it means the obvious: That you’re getting paid for your work. But more than that, it also means comporting oneself in a professional manner, both privately and publicly. Write every day, or as close to every day as you can. Hit your deadlines. Don’t speak ill of other writers or of editors, agents, or publishers in public venues. Take constructive criticism seriously and gracefully; be willing to revise, to rethink, to entertain the notion that you might not have gotten it right the first time. But also remember that ultimately it’s your book, and be prepared to stick to your guns if you feel the book needs to be written a certain way. Those are the things professionals do; they separate serious writers from dilettantes. 3. As an author and medical humanist, I am always interested in the intersections of history and fiction. Given your recent Thieftaker series, can you say a bit about the relationship between research, history and the creative process? As I’ve mentioned, I have a Ph.D. in history. I care about the discipline, and I strive for authenticity when writing historical fiction. That said, I think it’s important to remember that for a novelist, history and research are tools that can enhance the creative process. But that’s all they are. As a writer of fiction — even historical fiction — my primary allegiances are to character, setting and plot. If historical accuracy works within the bounds of those narrative concerns, great. If it doesn’t, and if there is no way to make it work well, then accuracy be damned, because I have a story to tell. That probably sounds more flip than I mean it to. I took great pains to make THIEFTAKER as authentic and accurate as possible. When I could bend my narrative to accommodate historical circumstance, I did so, because I wanted my story to be as close to history as possible. But in the end, I was writing fiction. I was writing to entertain a 21st century audience, and I felt strongly that my first responsibility was to them, not to the history texts I referred to in my research. 4. I know you often have sample chapters of your work online. I do this, too, as it seems a good way to market stories. Can you speak about this—about not giving too much away but still attracting a tech-connected audience? Any other thoughts on marketing strategies? We live in an age in which people have grown accustomed to sampling before buying. Music vendors make available small sample passages from songs, mall restaurants give away small pieces of food to lure in customers. So it’s not that surprising that authors should do the same. Frankly I welcome the opportunity, because I have always felt that if readers gave my work even a quick look, they would be drawn into the stories. And, I’ve found that my sample chapters really do help me sell my books. I don’t worry too much about giving too much away in terms of plot spoilers and that sort of thing, because I usually limit my free samples to the first two or three chapters of my books. My feeling is, anything that is revealed that early in the novel really can’t be considered a surprise. So I make the work available, and I hope that it will bring me a wider readership. I have found with THIEFTAKER, that used properly Facebook and Twitter are truly effective tools for publicity and promotion. It’s not so much about shouting “Read My Book! !” at the top of one’s lungs, as it is about networking, about sharing links with other audiences and cross-pollinating our readerships. It’s an exercise in reciprocity, and it definitely works. 5. You had a very successful writing career under another name in fantasy before the historical fantasy series you are presently working on. Could you talk a bit about your decision to write under a pseudonym? Was the decision motivated because you wanted to strike out in a new genre, or perhaps do the old genre in a new way? The pseudonym was basically a branding decision. Nearly all my published novels up until THIEFTAKER had been epic, alternate-world fantasies. They were set in Medieval-type worlds and had lots of intrigue, sorcery, battles, etc. And they usually had many point of view characters and were written in the sweeping heroic style often associated with epic fantasy. They are fun books; I enjoyed writing them, and could certainly see writing more of them. But THIEFTAKER is a very different kind of book. It’s not only historical fantasy, it’s also urban fantasy, and so has a leaner style, a more hard-boiled voice. It’s got only one point of view character. Each book also has a mystery element and each is a stand alone story, as opposed to an extended story-arc. And so in nearly every way the Thieftaker novels are going to be different from my old stuff. In order to avoid confusing readers, or worse, disappointing them with a book written under my own name that is nothing like my old work, we went with the pseudonym. So, I guess you could say that we made the decision because I had already struck out in a new direction. It was a reaction to the fact that I was doing something new. 6. Every writer has a different writing strategy—or so I tell my novel-writing students. How do you approach the writing process? Revision? Writers’ block? The writing process can mean so many different things. I tend to write every day, during certain hours — usually something akin to “normal business hours” while my wife is at work and my kids are at school. I try not to work nights and weekends — that is family time, and that’s really important to me. In the age-old “Planner vs. Pantser” debate, I am more of a planner. I outline my books, although rather roughly. I’ll outline by chapter with only a sentence or two describing in the broadest terms what is going to happen in each chapter. That way I have some plot markers to keep me on track, but I also have enough freedom to let my characters and my narrative roam just a bit. I write somewhat slowly (although to aspiring writers my pace will probably sound pretty fast). I shoot for 2,000 to 2,500 words per day. I have friends who write as much 4,000 or even 6,000 words per day; I can’t do that, in part because I tend to do a lot of polishing as I write. So I don’t finish my books as quickly as some of my friends do. On the other hand, many of my books need less revision after the initial draft is done, because I’ve taken that time to polish. That said, I spend a good deal of time revising and rewriting, because I never, ever get it just right the first time. I send my manuscripts out to beta readers and take their criticisms very seriously. Which is not to say that I don’t sometimes disagree with some feedback or suggested changes. But I certainly make sure that I’m resisting out of artistic concerns rather than egotistical ones. As for writer’s block, here is the abbreviated version of my Writer’s Block Rant. I don’t believe writer’s block exists. Writing is hard. It is filled with fits and starts, frustrations and setbacks. The very idea of writer’s block presupposes that writing ought to be easy, that it ought to flow, and that when we get stuck we’re “blocked.” That’s nonsense. Getting stuck is part of writing. Struggling is part of writing. And so what other people call writer’s block, I call “writing.” It’s hard, it’s uneven, it’s ugly. That’s the nature of the beast. 7. As the mentor for a university writing club, I often preach to my students about the value of networking and workshopping. Could you say a bit about your own responsive readers and mentors? Your approach to criticism? I covered a bit of this in the previous question. I am deeply fortunate to have several good friends — writers all — who are willing to read my work and give me feedback on it. I respect their opinions and I take their criticisms seriously and in the spirit in which they are offered. I also have an agent who I trust and love, and who is a great critical reader, and I have an editor at Tor who has worked with me for years, and who knows my writing as well as anyone in the world. All of these folks are interested in the same thing — they want to help me make my book as good as it can possibly be. And so I listen to their advice, I look for patterns in their reactions. If one of them says something critical about a passage or a character or a plot twist, etc., I will consider it and see if I agree. If several or all of them say something about the same section of the book, I KNOW I have a problem that I HAVE to fix. But I trust them all and I consider their words carefully. If I wasn’t going to do this, why would I have them read the manuscript in the first place, right? 8. Do you have advice for new writers on “breaking in” to the publishing world? Or upon the need/value of agents? Love it. This business is hard. H. A. R. D. It’s hard to break in, it’s hard to make a living, it’s hard to deal with the delays and setbacks, and it’s just hard to do the work. You have to love it to make it work. You’re probably not going to make a lot of money. Few of us do, and the ones who get really rich are the exceptions, the lucky ones. So you have to just love to write, to play with plot lines and create characters. More than that, though, you also have to love your stories. People talk about writing “to the market” and I can tell you it’s almost impossible to do. The market is a moving target, and while vampire gerbil novels might be all the rage today, if you start YOUR vampire gerbil novel now, chances are that by the time it’s written, and revised, and sold, and published, the vampire gerbil craze will be long gone. Zombie Hamsters will be the new thing, and you’ll be stuck with a vampire gerbil book that no one wants. So don’t worry about the market. Write the book you love, the one you’re passionate about, the one that you really WANT to write. Because if it’s good — and it’s far more likely to be good if you love it — the market will find you. As for agents, every professional writer should have one. Agents do more than sell your book to a publisher and collect their 15%. Agents help you plan a career, they help you sell your books to foreign markets for translation, they help you interpret contracts and avoid bad contract provisions. They help you make subsidiary rights sales (movies, games, etc.) They help you promote yourself and your work. They give business advice, and, if you’re as lucky as I am, artistic advice as well. I adore my agent; I can’t imagine where my career would be without her. Wow. How much time do you have. Literary inspirations? Tolkien inspired me to read as much fantasy as I could get my hands on. Stephen R. Donaldson inspired me to try my hand at writing fantasy. Guy Gavriel Kay inspired me to write fantasy that was rich and literary and thoughtful and intelligent as well as exciting. My daughters inspire me everyday, with their love of life, their enthusiasm for all they do. My wife inspires me with her professionalism, her intelligence, and the fact that, beyond all explanation, she actually loves me. My brother, who is a professional painter, inspires me with his talent. My mother and father inspired me with their reverence for the written world. Inspiration is all around us. We just have to open our eyes and see it. 10. Finally, are there any forums, books, blogs or other sites and services you would recommend to new writers? Actually, there is one blog in particular that I can recommend without hesitation, because I am part of it and helped to found it. It is called Magical Words — http://magicalwords.net — and it is devoted entirely to the craft and business of writing. It was founded by Faith Hunter, Misty Massey and me (writing as David B. Coe) and it now includes other authors including Kalayna Price, C.E. Murphy, A.J. Hartley, Carrie Ryan, Mindy Klasky, Diana Pharaoh Francis, Lucienne Diver (who is also my agent) and others who appear on occasion. The content is always being updated, and the archives are a treasure trove for those seeking advice on any aspect of writing or publishing. We also have a book out from Bella Rosa Books called HOW TO WRITE MAGICAL WORDS: A WRITER’S COMPANION. I can recommend that, as well. Thanks for the great questions, Brandy. I enjoyed our exchange and look forward to continuing our conversation with your readers! Great to have you, David! Solid interview. I particularly appreciate the author’s stance on family time. I see too many writers spending every night and weekend hammering away, and IMHO that’s not good for writers, or their families. Thanks, Jonathan. I agree with you — family time is far more than an obligation; it’s a tonic. I’m very jealous of those hours.